The Ins and Outs of Title V Permitting - Environmental Quality Management, Inc. Although we are almost 30 years beyond the beginning of the Clean Air Act’s Title V air permitting program, many new environmental professionals and facility managers may ask “What is a Title V permit?”. Simply put, a Title V permit is a federally enforceable operating permit for facilities that are major sources of emissions. In the past, air operating permits were typically handled by individual state agencies. However, since the Clean Air Act Title V operating permit program, all individual state-issued operating permits were combined into one federally enforceable Title V operating permit for major facilities. This allows for consistency with permit requirements and language, while also incorporating federal air regulatory requirements into the facility’s air permit. State and local agencies are involved with writing the permits, but the EPA has the final review and approval of the permit. Title V permits can have far reaching impacts for businesses in a variety of different industries. Manufacturing facilities, petroleum refining sites, utility plants, and printing operations, to name a few, can have facility-wide potentials to emit (PTEs) that exceed thresholds that require Title V permitting. PTE must be calculated based on an emission unit’s maximum operation without operational restriction (e.g., 24 hours per day, 365 days per year) unless the operation and resulting emissions are restricted by a federally enforceable permit limit. The EPA has established maximum ambient air concentration levels for each pollutant. To ensure levels are not exceeded, state air agencies are required to establish implementation plans that limit or reduce emissions from air emission sources. Air permitting and regulatory limits on pollutant emissions are part of those implementation plans. Facilities are also considered a major source of emission if they have the potential to emit 10 tons or more of an individual hazardous air pollutant (HAP) or 25 tons or more per year of all HAPs combined. HAPs are toxic air pollutants, also known as “air toxics”, determined to cause cancer and other serious health impacts. There are 187 listed HAPs that include some common solvents and chemicals like methanol, toluene, glycol ethers, ethylene glycol, and chlorine. The EPA has developed technology-based standards [maximum achievable control technology (MACT) standards] for controlling the emissions of HAPs from sources in certain industry groups (or “source categories”). These are based on emissions levels that are already being achieved by the controlled and lowest emitting sources in an industry. Title V issuance and annual permit fees, monitoring and record keeping, or air pollution control investment can have a significant impact on a facility’s business. In addition, these permits are not evergreen but must be renewed. 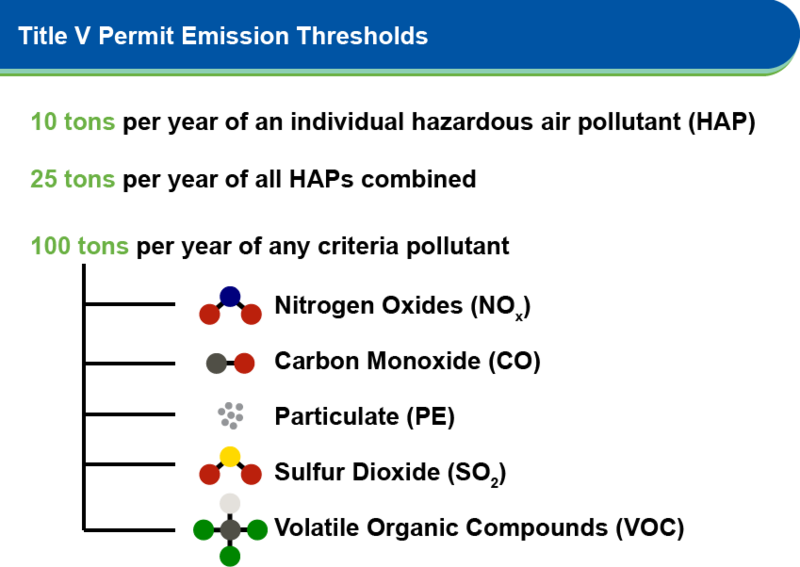 Many facilities with PTE above thresholds find they can obtain a synthetic minor state operating permit to avoid Title V permitting by limiting operations and emissions through permit restrictions. My facility has been issued a Title V permit, now what? One of the goals of the Title V permit program was to develop operating permits that contain requirements for ongoing compliance monitoring and assurance. As a result, Title V permits require monitoring, recordkeeping, and reporting requirements for individual emissions sources. Facilities should review and understand their Title V permit obligations to ensure all requirements are met on an ongoing basis. 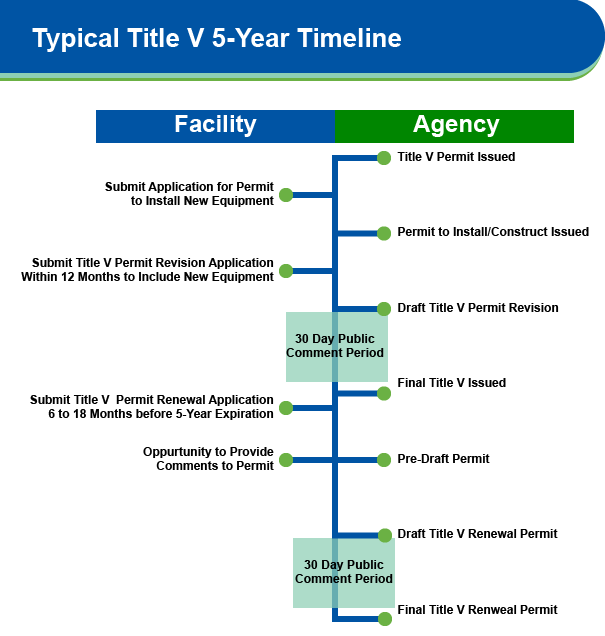 Every Title V permit has a 5-year renewal period. But that doesn’t mean facilities can wait until the permit is exactly five years old to start the renewal process. Title V renewal applications must be submitted between 6 and 18 months prior to the permit’s expiration date, which means the process should start at least 18 months before the permit expires. The first step in renewing a Title V permit is to review the list of emission units (EUs) present at the facility to ensure that all units have been identified and, if required, included in the permit. For EUs that must be included, process and emission information must b e provided and applicable regulatory requirements must be identified in the application. Agencies also require a list of insignificant and permit exempt emission units. Each permit exempt EU also requires a basis for its exemption. The next step is to complete the application forms. For most states, there is an online submittal system. This ensures that the forms are contained together in a complete submittal package. Some states, however, still require hard copy submittals. After submission, the local air agency will provide a draft permit to the facility for review prior to the submittal to the state agency for finalizing. This is a facility’s opportunity to review the draft terms and conditions. Reviewing the draft ensures that permit terms are correct and that the monitoring and record keeping requirements have a sound regulatory basis and can be performed for the regulated equipment. Permit terms can be negotiated, but once the permit is approved at the local/state level, the state agency seeks EPA approval and then provides the public with a 30-day comment period. Altogether, the renewal process can take several months depending on the complexity of the facility and number of emission units. This 5-year cycle isn’t the only event that can trigger the need for a Title V permit application submittal. Permits must also be revised or modified whenever emissions units that require a permit-to-construct or install (PTI) are added to a facility. If new construction or modifications to existing permitted equipment is planned, then a PTI must first be obtained. After the PTI is issued the terms and conditions must be added to the Title V operating permit. This is done through submittal of a Title V permit revision/modification application. The revision application is typically required to be submitted within 12 months of commencing operation of the new or modified equipment. What Happens If I Don’t Renew My Title V Permit? Without a renewed Title V operating permit, the facility will be operating illegally. First, a warning letter requiring the facility to submit the application by a certain date will be sent. Beyond that, a notice of violation will be issued, and the facility could be required to pay a penalty for late submittal, all on the federal level. Bottom line, it costs more in the long run if you fail to renew a Title V operating permit than it will to renew it. 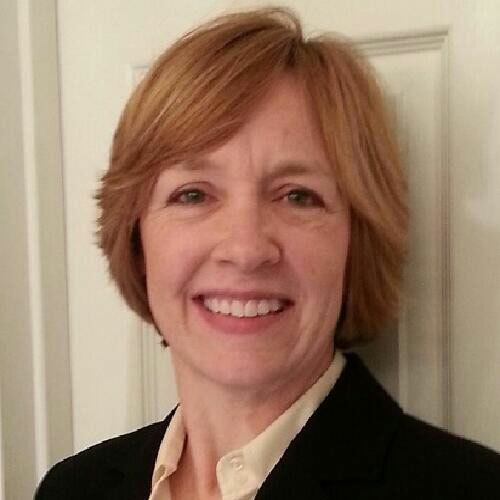 Dawn has 30 years of experience in environmental compliance and management. 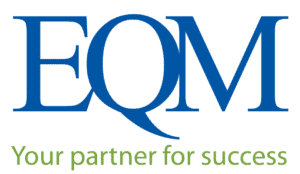 Her primary role at EQM is leading the consulting group in assisting clients with environmental compliance. She has been involved in a broad range of programs including new source air permitting, MACT/NESHAP and Title V compliance, Risk Management Planning under 112r, EPCRA Compliance, chemical process engineering/toxics release analysis, and environmental compliance auditing. Dawn graduated from the University of Kentucky with a B.S. in Chemical Engineering and is a registered Professional Engineer in Ohio, Kentucky, and Florida.